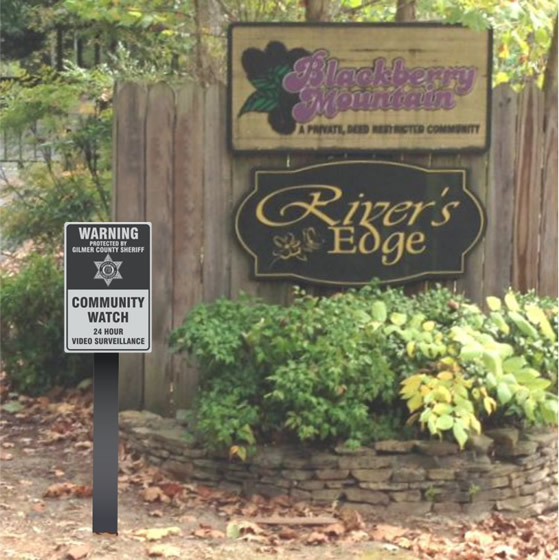 Blackberry Mountain is a private, gated, deed restricted community. Properties for sale may be viewed when accompanied by real estate agents and property owners only. 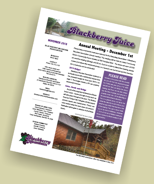 To protect the privacy of Blackberry Mountain Association members, the membership directory is not available to the public. Contact the association office to obtain a copy of the directory. 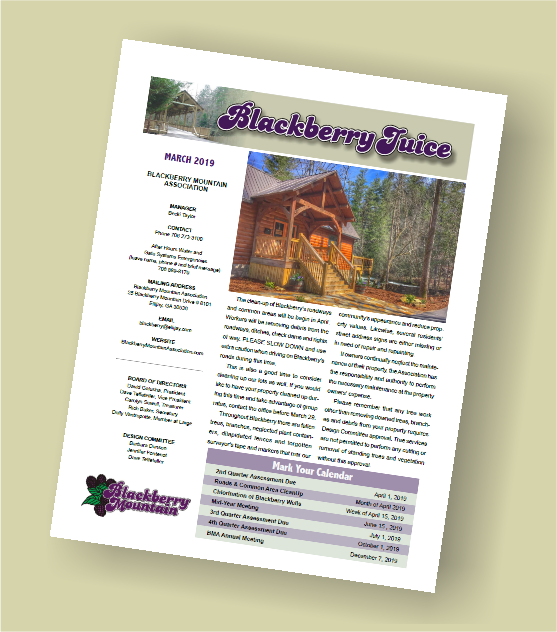 Download the March 2019 Blackberry Juice. Bears are present in Blackberry. Please do not leave any food out (bird feeders, deer, pet food or garbage). Bears have a very keen sense of smell, it is dangerous for the bear and for residents by luring bears away from their natural food sources and dissolving the bear’s natural fear of humans. Removing the food source to bears is a critical step in resolving bear/human conflict. 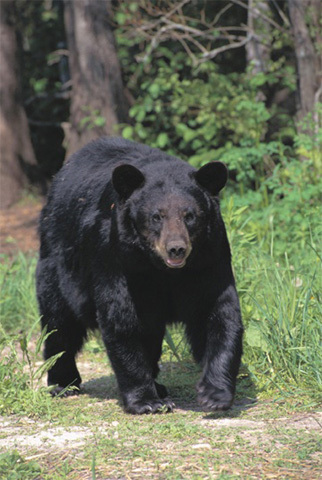 It may take a few days for the bear to learn that it is no longer going to be provided with a free and easy meal; once he does he will move on to another area. There have been no recorded bear attacks on humans in Georgia, but it is important to remember that while it may be exciting to see a bear – they are wild animals. You should never approach a bear. Keep your pets under close watch as we have also had coyotes in the area and they are known to attack small animals. Download the November 2018 Annual Meeting Report. Click on the image to download the newsletter. Click here to download the Telecom survey. Click on the image to download the Adobe Acrobat Reader pdf file. 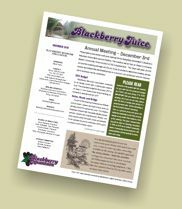 Download the December 2017 Blackberry Juice. 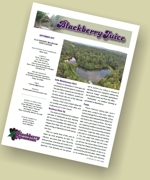 Download the November 2017 Blackberry Juice. 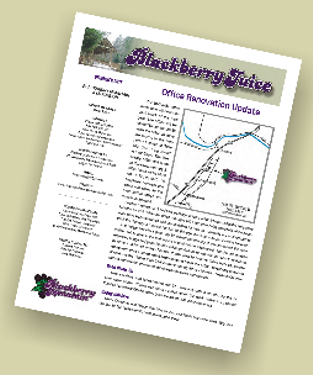 Download the September 2017 Blackberry Juice. Building on the colonial America concept of town watch, Community Watch is simply an organized group of neighbors committed to vandalism and crime detection and prevention - NOT intervention. Communication is a key element of this program, and technology can be a useful communication tool. 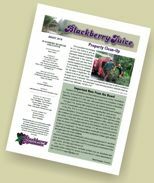 If interested, check out and join the Blackberry Mountain Next Door Community. 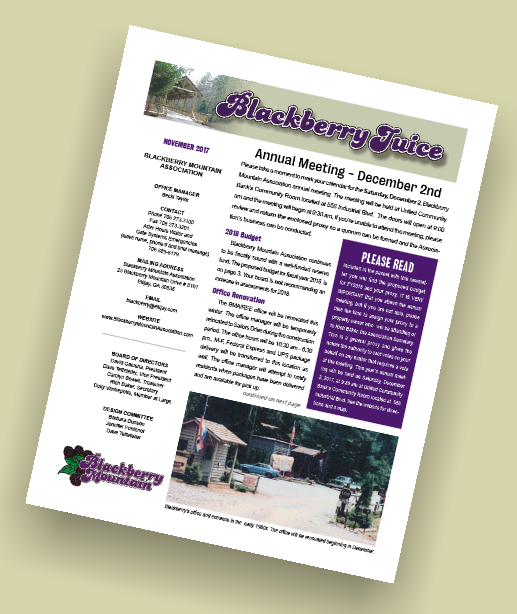 Download the Annual Meeting December 2016 Blackberry Juice. Blackberry's Hemlocks are under attack by the invasive Woolly Adelgid. All of the hemlocks were treated in the early summer of 2012. However, you may continue to see the insects' white, cottony egg sacs for some time. The larger trees will be re-reated in 2013 as well. The treatment program has been funded through association dues and will be paid over a 3 year period. 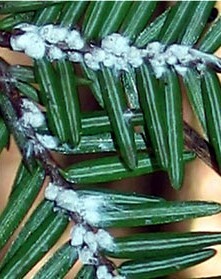 The hemlocks have been treated with soil-injected imidacloprid. Imidacloprid can take from 6 weeks to 12 months or longer to become effective depending on the size of the tree, and it might take several years to achieve complete control and show new growth, particularly in large diameter trees. Improvement on infested hemlocks means a lessening of the infestation, very little reinfestation (new bright white egg sacs) the following spring, improved foliage color and density, and new growth on the branch tips. Small trees take up the solution and disperse it throughout the entire tree in a matter of months, and normally show improvement between 6 and 12 months. This process takes longer for larger trees, sometimes as long as 12 -18 months. Since the lower limbs are the last part to receive the benefit of treatment, they are usually the last ones to show improvement. Contact the office to obtain information about attending a meeting or having an item placed on the agenda.